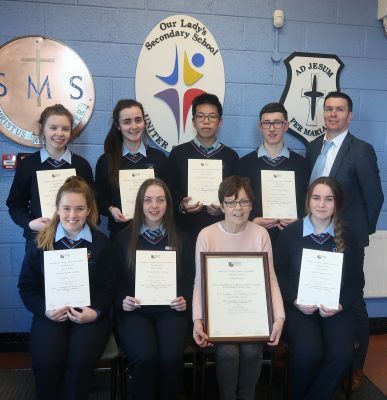 Pictured in Our Lady’s are seven students who attained a grade ‘A’ in Higher Level Business in the 2018 Junior Cert. Back row: Kornelia Ligudzinska, Tara Quinn, Vincent Chen, Andrew Duffy, Principal Mr Eddie Kelly. Front Row: Melissa Carr, Taryn Clarke, Business teacher, Ms Mary Rafter and Chloe Caulfield. Missing from the photo is Business teacher, Mr Paddy Mulroe. Chloe Caulfield together with her parents and Business teacher, Ms Mary Rafter attended the presentation at Maynooth University where Chloe accepted Awards on behalf of her peers. Back at the school, Principal, Mr Eddie Kelly presented the awards to the seven students. Well done to all concerned. Congratulations to seven students from Our Lady’s who achieved a grade ‘A’ in Higher Level Business Studies in the 2018 Junior Cert and whose achievement was acknowledged at a ceremony in Maynooth University hosted by the Business & Law Departments on Tuesday 29th January. TY student, Chloe Caulfield represented her peers at the presentation, namely Melissa Carr, Taryn Clarke, Vincent Chen, Andrew Duffy, Kornelia Ligudzinska and Tara Quinn, all of whom received ‘A’ grades in JC Business Studies, while Business teacher, Ms Mary Rafter accepted a presentation on behalf of the school. The presentation took place in the Aula Maxima and was followed by a reception in the Pugin Hall. President of NUI Maynooth, Professor Philip Nolan addressed the audience which had teacher and student representatives as well as parents. He complimented the young people on their wonderful achievement; only 9% of students who sat Higher Level Business achieved an ‘A’ grade and everybody in Our Lady’s is indeed very proud of these students. < Previous Why are Catholic schools so popular at a time of increased secularisation?